Amazing interactives Ltd are a specialist 3D software content developers and manufactures of the 3D Pain Distraction System. Our client, Manchester Children’s Hospital Charity wanted to donate to the hospital our 3D Pain Distraction Systems, however they wanted them to be personalised with their charity mascot, which is Humphrey Bear. 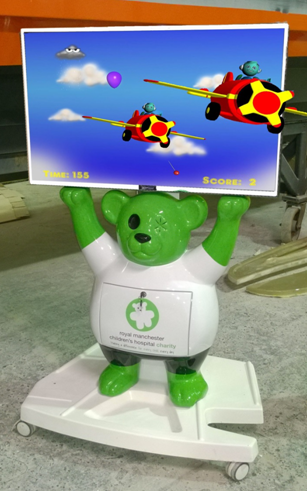 Amazing Interactives approached Fibreglass Solutions based in Stockport to take on the challenge to design and manufacture Humphrey Bear, which then allowed us to install Humphrey Bear to our 3D systems. The process involved working closely with Richard Pemberton, Composites Production Director to manage the design process and once designed he then manufactured them to a very high standard that was met with approval by both Amazing Interactives and Manchester Children’s Hospital Charity. The whole process was conducted in a highly professional manner, within budget and on time, an excellent company to work with on our future developments. Pravin Jethwa – Business Director Amazing Interactives Ltd.